1985 was the year GI Joe really started to come into its own. The cartoon was on, and most of the famous characters came out then - Snake-Eyes, Shipwreck, Lady Jaye, the Crimson Twins - and a lot of new diversity was added to the ranks on both sides of the battle; for instance, the Cobra Snow Serpent. Snow Serpents are the Arctic Specialist branch of the Cobra Eel unit (Cobra Frogmen). They must undergo the same rigorous training program as Cobra Eel troops with the addition of a six month cold weather course somewhere above the Arctic Circle. Other aspects of the training include airborne operations (under arctic conditions), anti-tank procedures and the use of snow-shoes, skis, and kayaks. You know, we always use Arctic Batman as an example of how bad variations can be, but in most cases, the "snow suit" verions of characters are pretty cool - no pun intended. Granted, the Snow Serpent isn't technically a variation (not like Arctic Shield Batman is), since there's no "non-Snow" Serpent. Heck, if they come out of the Eels, they weren't even snakes to begin with. The Snow Serpent shares most of his sculpt with Arctic Snake-Eyes, which is fine - as usual, Hasbro has given him enough accessories to make him look entirely different. Instead of a parka, he's wearing a gray jumpsui, but it still has large pockets on the chest and legs. His forearms, covered in fur, are new pieces, as are his shins and feet. And of course, his head is the classic Snow Serpent helmet, though the goggles pushed up on his forehead now have the advantage of being cast from translucent plastic. Part of what sets the Serpent apart from the Snake(-Eyes) is the fur trim on his suit. He has a separate piece comprising neck and shoulder tufts held in place by the toy's head, in addition to the forearm fur we mentioned previously. 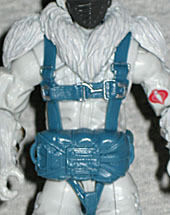 He's wearing blue web gear (to match his boots), and has a pack strapped to his waist - on the G1 toy, that was a separate piece, but here it's attached. You could probably work the entire contraption off if you were determined to do so, but it sure isn't easy. The Snow Serpent's body may be re-used, but that just means the articulation is as good as ever: balljointed head, shoulders, elbows, torso, hips and ankles, swivel gloves, and double-hinged knees. His accessories are all updates from G1 - a machine gun, a gray backpack, a pair of snowshoes and an anti-tank launcher with a separate stand. The snowshoes plug into his feet, of course, but there's a second hole to allow use of the included display stand. The rocket launcher can plug onto the side of the backpack, so he can tote it across the frozen wastes easily. Once again, Hasbro has proved that they can repaint and retool their GI Joe bodies, and create an entirly distinctive look. The Snow Serpent was already one of the neatest designs in the old toys, and his G3 update lives up to that in every way. He plays well, and he looks great. Yes, this may be yet another arctic-suited action figure, but he's no cheap variation, and an excellent addition to the G3 lineup.